May 1 marks five years since the European Union opened up to bring former eastern bloc countries into its fold, taking it to 27 members. But instead of fanfare and fireworks, the mood is muted in New Europe and among the E.U.’s veterans. The post-1989 boom in central and eastern Europe  when new E.U. members enjoyed average GDP growth around 5.6% per year from 2000 to 2008  has been punctured by the current economic downturn. Many of the new E.U. countries are on a downward spiral as credit dries up, demand collapses, currencies tumble and unemployment surges. Some of the E.U.’s older members are suggesting they may have opened the doors to the club prematurely: they grumble that the new members are dragging the E.U. down further into recession. And there are calls to pull up the drawbridge on other would-be members who are right now lining up on the E.U.’s borders. See the world’s most influential people in the 2009 TIME 100. Few doubt that enlargement helped transform the region. 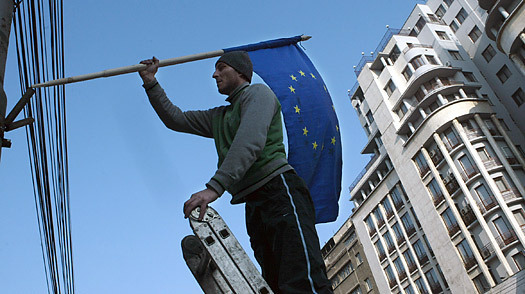 Eight central and eastern European countries joined the E.U. five years ago along with Cyprus and Malta, while Romania and Bulgaria followed in 2007. The enlargement process encouraged a wrenching industrial overhaul of those nations, based on the privatization and liberalization that was set as part of the price for E.U. membership, and in doing so shepherded their makeovers from stodgy Soviet vassals into economic dynamos. Slovakia and the Baltic states saw growth rates as high as 7-10% in their best years. And in Poland, the unemployment rate dropped from 19% to 9.5%; in Lithuania, it plummeted from 11.4% to 4.7%. But when the financial crisis hit, these darlings of international capitalism found their open economies amongst the most vulnerable. The International Monetary Fund  recently involved in bailouts for Hungary, Latvia and Ukraine  now forecasts a 3.7% drop in GDP for the central and eastern European region for 2009. The downturn has brought down governments in Latvia and Hungary, and a prolonged crisis could translate into further political instability. For the older member states already wary about migrant labor, the recession has aggravated concerns over low-cost competition for jobs at a time when work is scarce. It shows in public opinion: a Eurobarometer survey last December found that 59% of people in the 12 newer members thought the E.U. was strengthened by enlargement, compared to just 44% in the 15 older members. There are more countries perched on the E.U.’s outer rim, eager to join, but the downturn means they are probably in for a long wait. A plan to draw poorer neighbors such as Armenia, Belarus and Ukraine closer to the E.U. will be launched on May 7. But this “Eastern Partnership”  which nudges them towards European norms of democracy, open markets and the rule of law  is also jeopardized by the crisis. “When E.U. member states themselves are entering dire straits, it will also be increasingly difficult to commit more E.U. funding for the neighbors,” says Nicu Popescu from the European Council on Foreign Relations. Germany and France, always wary of enlargement, have raised doubts about Turkey and the Balkans, who are currently in talks to join. Last month, German Chancellor Angela Merkel called for a “phase of consolidation” in the E.U. once Croatia becomes the 28th member in a few years. Enlargement skeptics like Merkel and French President Nicolas Sarkozy raise mainly political objections but the recession gives an added budgetary argument. However, the result is likely to be the same. Although the European perspective has been instrumental in guiding young democracies out of the grip of authoritarianism and autarchy, this power to transform the fringe is slipping. With the prize of becoming an E.U. member seeming to move further and further out of their reach, the Balkans and Turkey  politically fragile and economically vulnerable  could reverse any reforms they’ve already undertaken in order to turn themselves into better E.U. candidates. Which makes it even more important to see enlargement as part of the solution, not the problem, argues E.U. Enlargement Commissioner Olli Rehn. “While combating the economic recession, we must not make E.U. enlargement a scapegoat for it,” he said in a speech last month. “Questioning our commitments on E.U. enlargement will not help us at all to tackle the economic downturn. Let’s keep in mind that our economic troubles are not the fault of a Serbian worker or Croatian civil servant.” He may well be right. But in this gloomy economic climate, they are easy targets. And they are learning the hard way just who their real friends in the E.U. are. See pictures of the G-20 protests in London. See pictures behind the scenes of Obama in Europe. Can top luxury brands survive downturn?